Treu Body Works: We take the dents out of accidents! Had an accident? Need repairs? 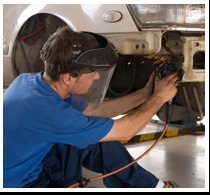 Trust the technicians of Treu Body Works to help. Locally owned and operated, our shop has been offering peace of mind to car owners since 1982. Having an accident is stressful enough. Worrying about the quality of your repairs should be the last thing on your mind. With friendly service, state of the art equipment, and years of experience, Treu Body Works makes car repair easy. Call Treu Body Works today!